No government response to the threat to W.A. by cane toads. Community Driven Cane Toad Volunteer Leadership Toad Busting and Training Weekend a huge success. “The Kununurra Community has now proven the strength of its commitment to stop the cane toad. 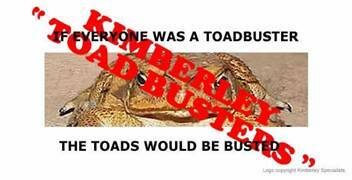 We want the State, Territory and Federal Government to directly support the Kimberley commitment to stop the cane toad from crossing into the Kimberley ” said Dr Sara Brett. Organised by Lee Scott-Virtue and Dean Goodgame of Kimberley Specialists, and Dr Sarah Brett, Kununurra veterinarian, the Toad Busting training exercise held at the Victoria River Roadhouse last the weekend 10 -11 September attracted 40 participants. The community volunteers, including the Kununurra aboriginal community elders and members led by Juju and Georgina Wilson who travelled 270 kms from Kununurra, were supported at the Roadhouse by Cathy Freeman and Deborah Mailman (ABC Secret Life of Us), who generously lent their support to this effort. Graeme Storey from the Darwin based community group and cane toad expert, Northern Frogwatch, travelled down from Darwin with his family, to conduct the training over the Saturday afternoon. Following dinner, the toad busters with lights, and plastic bags went toad-busting. “ Martin Hadley, CALM’s most experienced cane toad field officer and his wife attended the volunteer training exercise as community members but provided enormous assistance in making this first volunteer training exercise the success it was” said Sandra Boulter. CALM was officially represented on the first day of the program by Karin Carnes, Cane Toad Project Officer. 47 Toads were caught, mostly by hand, in a few hours at the Roadhouse and nearby Victoria River Crossings. Congratulations to everyone who participated in the training and can now take this knowledge into the community and support other willing volunteers”, said Lee Scott – Virtue. “The indigenous and non-indigenous children who were present delighted in the night torch lit exercise, shrieking proudly with every toad discovered and caught. The joy in the learning and joining in of the children with the adults was palpable and an unexpected side of the night”, said Lee Scott – Virtue. “It was agreed by everyone at the training exercise, including the agency representatives, that the only way to successfully resist the invasion is for a sustainable and well supported community volunteer program working with the co-ordinated help of government agencies both sides of the border,” said Graeme Sawyer. Local donations which made this weekend possible came from Lee Scott-Virtue, Dean Goodgame, Triple J tours, the National Bank, Liz Kirby and Sarah Brett, as well as generous in-kind input from the Kununurra Community in general. The Stop the Toad Foundation was represented by Lisa Brideson and the Foundation also contributed financially towards making this first training exercise the success it was. The Shire of East Kimberley has offered to assist in the ongoing Toad Buster Training exercises with communications systems, general equipment and transport and camping equipment. “We urgently need any relevant permissions, or acknowledgement that we do not need permissions, and support of and facilitation by the NT government for our volunteers led by trained leaders, to enter the NT National Parks and other lands to catch these pests”, requested Dean Goodgame. “The adult frogs from last year about ready to breed in the upcoming wet, can be found and destroyed if we get to them while there is so little water around as these are the only places they can have survived while growing to reproductive age.